In the browser toolbar, can I have separate dedicated VIEW OPTION selectors for each of the two Panes? I have ADHD. I find it very confusing that there are not separate VIEW OPTION selections for each of the two panes. 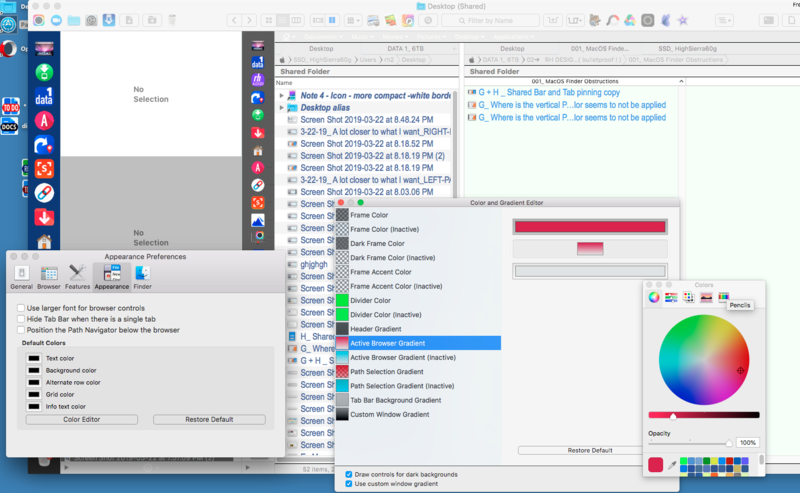 It takes far too much mental energy to expend to try to figure out various IF-THEN display options based on the state of things (as suggested in this very complex HELP ARTICLE https://support.cocoatech.com/kb/performance/all-windowsthis-window... ). 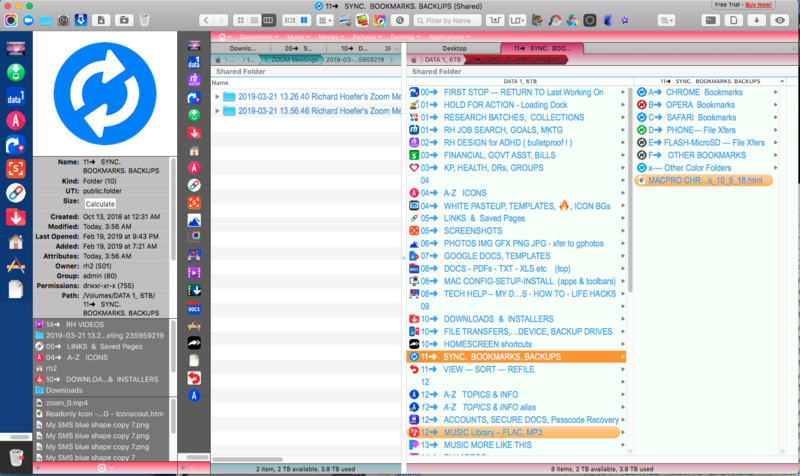 To me, using two panes within a single file browser should layout exactly as though I have butted together two separate Finder Windows. In Screenshot 1 below, my Pane 1 view has been selected as LIST VIEW. 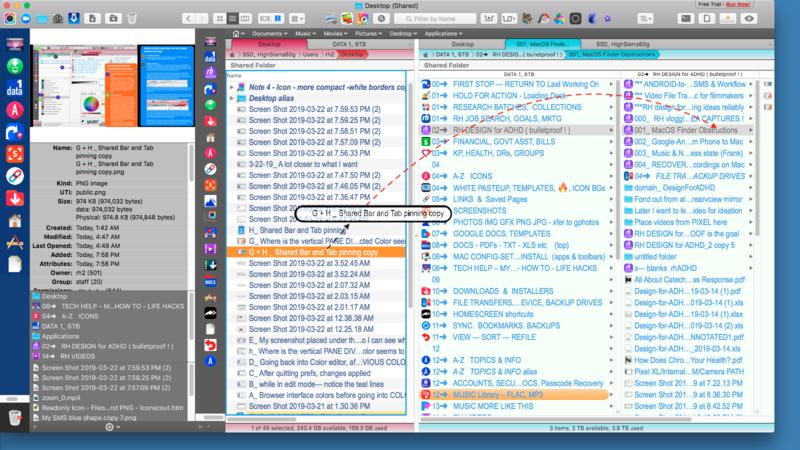 In Pane 2 it is COLUMN VIEW — but when looking at the screenshot, one could easily be confused as to thinking Pane 1 is also in Column View. In Screenshot 2 below I have "cut & paste simulated" what separate VIEW OPTION selectors would look like: Pane 1 shows List view, Pane 2 shows Column View — which is the actual way the panes are configured. Can someone suggest how I might better comprehend at-a-glance which view mode is selected for the active window. For example, is there a way I can dramatically change the interface "chrome" for ACTIVE vs INACTIVE Pane? Thank you. Here is screenshot 2. It wouldn't allow me to upload both images in one post. 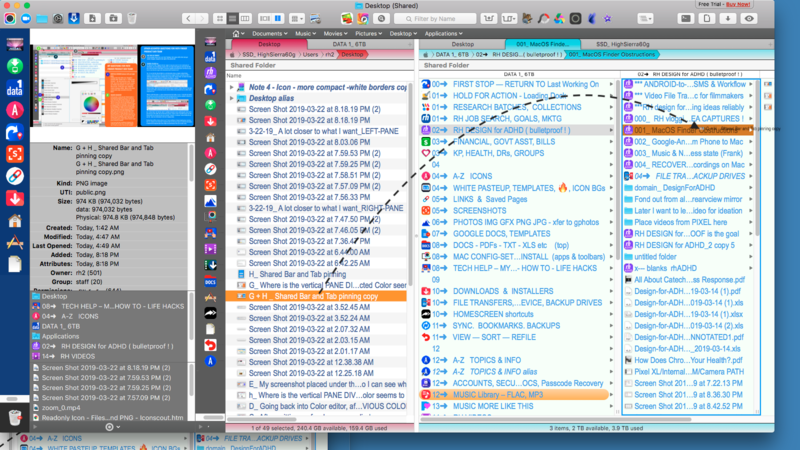 The toolbar is shared between the panes since they belong to the same window. It will always display the settings (i.e. which view mode is selected, etc.) for an active pane. Perhaps you would find it easier if you will be able to better differentiate which pane is active at the moment. This can be adjusted in Path Finder -> Preferences -> Appearance tab -> Color editor. Here, please change "Active browser window" (Active pane) and "Active browser window (inactive)" (Inactive pane). Path Finder Support Team closed this discussion on 21 Mar, 2019 10:56 PM. tremendously. Two snags though I wonder if you could help further with. control for THIS xyz interface element?"*. Could you please remind me what versions of macOS and PathFinder are installed on your machine? Path Finder colors should be changing in real time as you adjust them. There is no "pin tab" feature yet. I will forward your feature suggestion to our development team. As for the "Shared Folder" bar, it can be toggled from View -> Bookmarks Bar. The reason why there is only a lonely "shared folder" in it is you can't have less than one bookmark in it. Path Finder Support Team closed this discussion on 22 Mar, 2019 03:35 PM. Jordan, I am running 10.13.6 (17G5019) and Pathfinder v 8.3.9 . 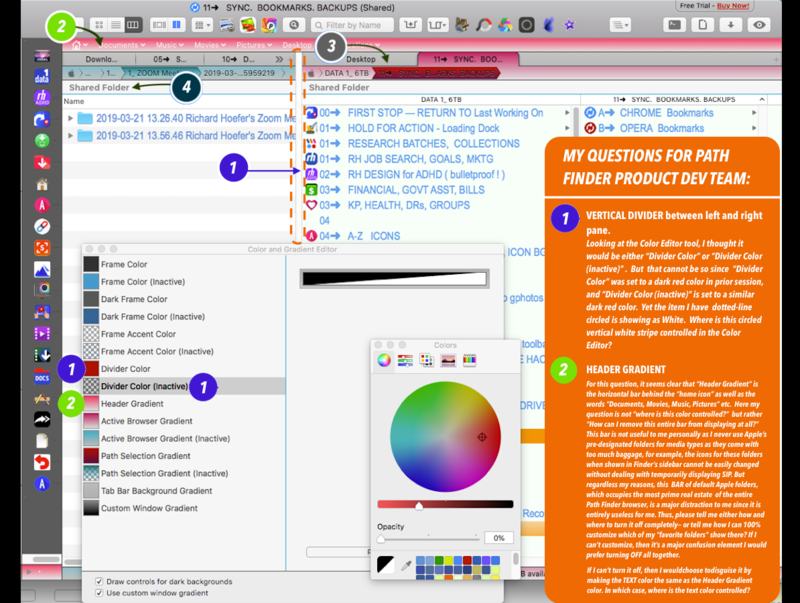 When Path Finder Preferences are open, and I select COLOR EDITOR, the Color Editor opens and I begin to interact with the Color Editor. 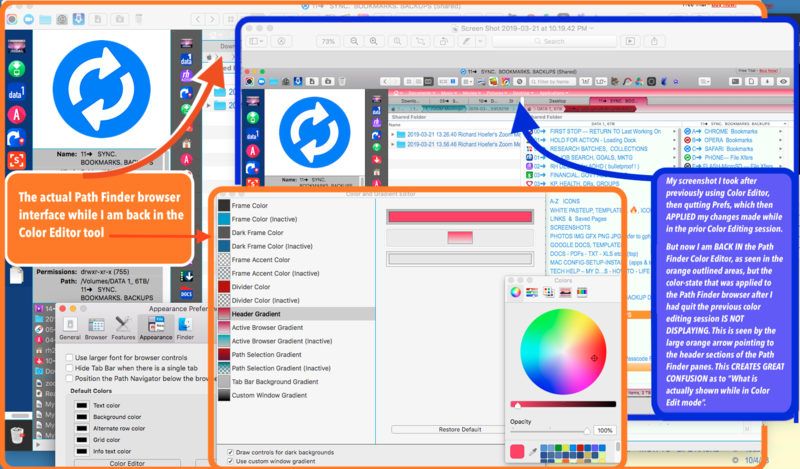 The real time color changes do not display in Path Finder browser (SCREENSHOT 1 below). SUGGESTION: It seems illogical for me to have to add the additional step between steps 5 and 6: "Select Path Finder Browser"
I have now been able to tweak my colors a lot easier with real-time changes showing, and I am getting much closer to the look & feel I want. THIS THREAD started with my asking about separate VIEW MODE selectors for the left and right panes so that I could tell which pane the VIEW MODE selector was refrerring to. You suggested using the Color Editor to make a clearer delineation between LEFT PANE and RIGHT PANE in their active and inactive states. That is exactly what I have now done. 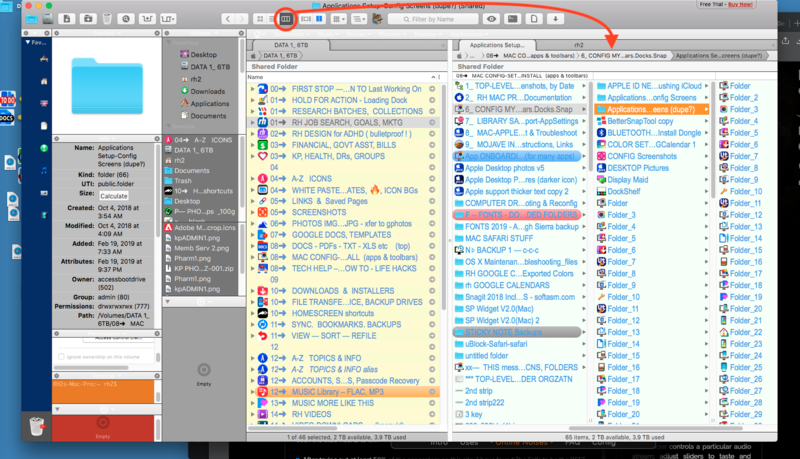 The ACTIVE PANE now has a red tint to the selected Tab and the Path Bar. The INACTIVE PANE now has a teal color tint to its selected Tab and to the Path Bar. Now it is very apparent to me which pane is active. It now meets my "Design for ADHD" standard of "bulletproof clarity", reducing what had prior been tons of cognitive processing while the brain skimmed across and down the various values of grey across the two virtually-identical panes. Also, with the real-time color displaying, I have been able to now darken the Header section so that it is equal to the background color of the "Icon Column" (column 3). They now form a very clear perimeter around the two distinct Left and Right Panes. *NOTE: I still am not seeing the Green "test color" that I assigned to "Divider Color", and I would still like the developer team to explain to me where on the interface is the "Divider" — both active and inactive. I would assign the vertical divider between the two pans to be the same dark grey as the Icon Column and Header, which would further "bulletproof" the clarity of Left Pane and Rught Pane. Also, for anyone else who might be following this, I made all sorts of Color Edits to Frame Color, Frame Accent Color, etc, in order to reduce the too-many-dark-line boundaries between interface bars. I wanted to add two more screenshots to show what is now pretty close to my everyday configuration. 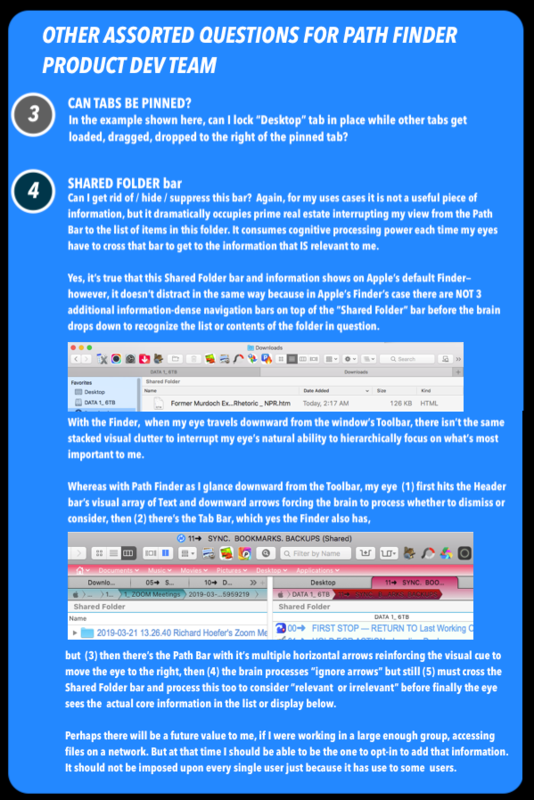 This has now enabled me to dispene with my old method of multiple FINDER windows, and then tabs within those mutliple windows strewn across my two large monitors. This, below, is closer to how I've always wanted to use a "finder" like tool. 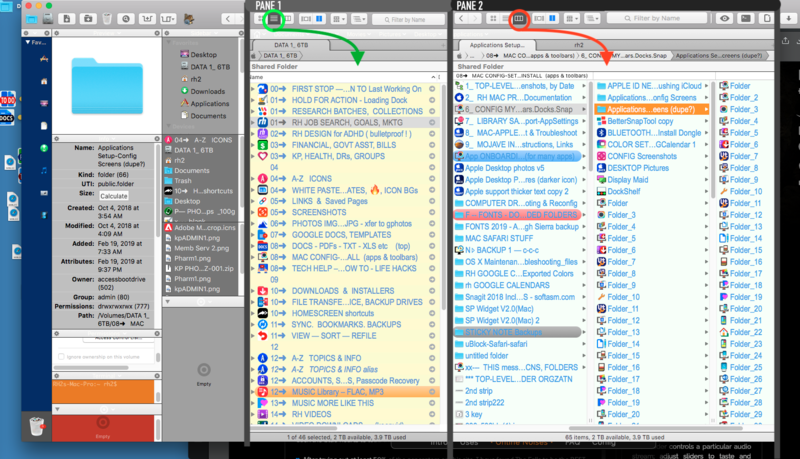 Really clear SOURCE and DESTINATION panes in one window. 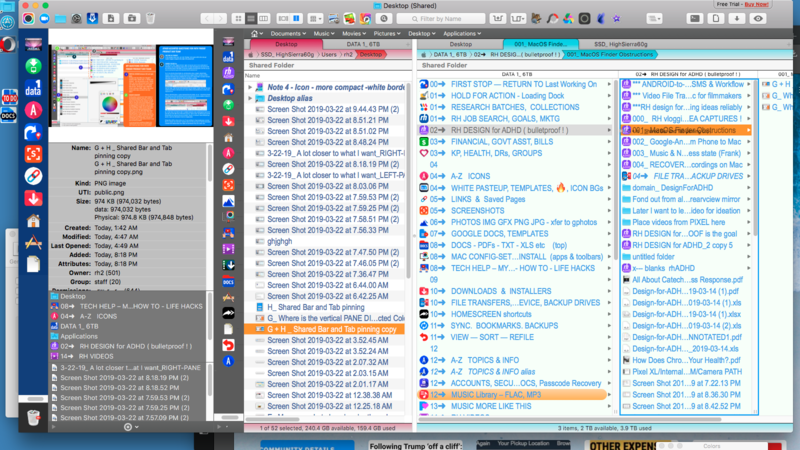 SCREENSHOT 1 of 2: Shows my desktop folder in LEFT PANE in list view. 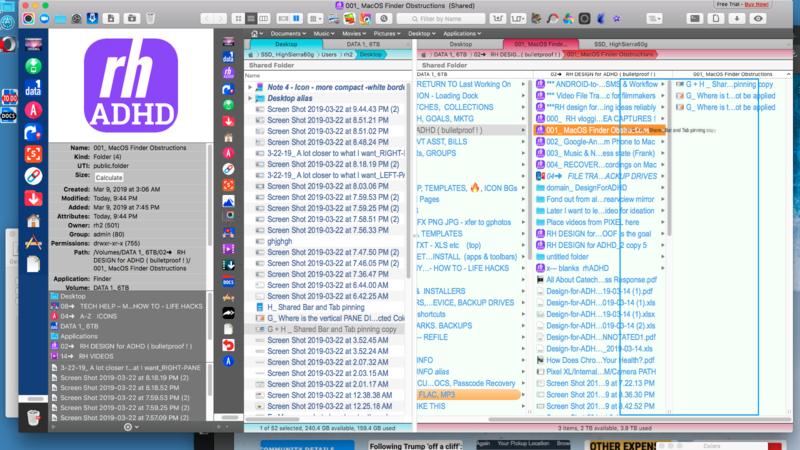 I want to drag & drop a desktop screenshot to its correct "home"in RIGHT PANE— in this case, my folder project for "Design for ADHD", within a subcategory of "MacOS Finder problems". SCREENSHOT 2 of 2: Shows my DROPPING the file into the RIGHT PANE, which — going all the way back to the oruginal topic of this thread — is displaying in COLUMN MODE. However, this screenshot is a slight cheat, in order to illustrate the annoying problem of Column View AUTO-SCROLL. 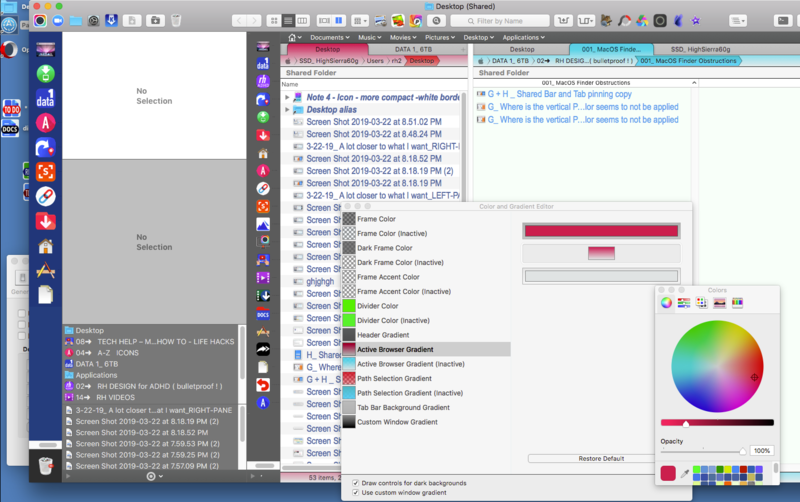 The screenshot shows the behavior I WANT — but it is not the behavior Path Finder delivers. 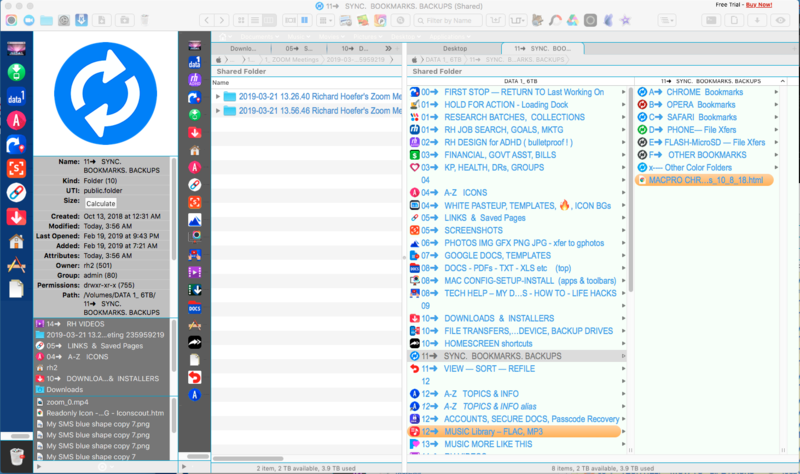 Here is SCREENSHOT 2: The Right Pane does not auto-scroll to the right: it remains fixed, while "silently" expanding the view to the right to open the subfolder I selected. By contrast, here is how Path Finder actually displays this DRAG-DROP action from Left Pane to Right Pane. It auto-scrolls the Column View in Right Pane, pushing the column panel to the left, which causes me to lose focus on the parent folder. 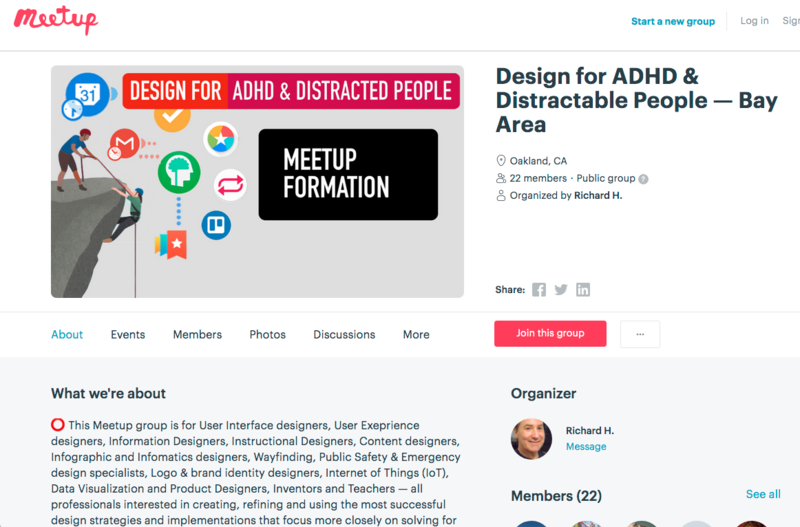 This is disconcerting and distracting for people with ADHD. DON'T MOVE the colum automatically. I will manually scroll horizontally to see which subfolder opened. Just so you know, I have forwarded your messages (including this thread) to our developers. Regarding your current Path Finder design for ADHD and distracted people, which could be useful to other Path Finder users, would you like to keep the current thread open or start a new dedicated one? Nevertheless, every new reply reopens it, so other users should be able to comment and subscribe to your thread regardless of its status. Path Finder Support Team closed this discussion on 23 Mar, 2019 06:07 PM.